You can quickly go to any line in a TextEdit document by using a hidden hot key. Many users of Mac TextEdit are used to Windows NotePad which offers find line by default in menu options. 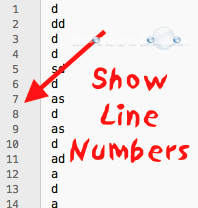 Even though TextEdit doesn’t show line items, you can still search for a particular line. Follow the steps below. 1. Open a file in TextEdit. 3. This will reveal the Select Line box. You can type in any line number your document has to go to it. If the line does not exist, you will receive an error: invalid line specification. So now you can quickly find any line in a TextEdit document. Let us know if you have an easier way to do this. If you are looking for a way to display lines in TextEdit, you will need to download a 3rd party text editing program such as TextWrangler for mac.